SomniFix Mouth Strips are an innovative new product for promoting healthy and quiet nasal breathing to stop your snoring. Breathing through your mouth is one of the most common causes of snoring. If you’re snoring and find yourself waking up with a dry mouth and sore throat, it’s likely that mouth breathing was the cause. Breathing correctly sounds simple, but many of us are getting it wrong and snoring as a result. This simple sleep therapy discourages noisy mouth breathing, giving you a quieter and more peaceful night’s sleep. What are SomniFix Mouth Strips? SomniFix Mouth Strips are single-use adhesive strips worn on your lips during sleep. By holding your lips together and gently supporting your jaw, air is channeled through the nose, reducing the likelihood of airway blockage and snoring. Mouth taping is a known snoring prevention technique, but SomniFix have engineered a superior, next-generation product that is far more comfortable, effective and less frightening than basic taping alternatives. SomniFix’s specifically developed adhesive is gentle enough to be painless when removed from the lips, yet strong enough to hold the mouth shut properly. The hypoallergenic, sterile material is kind to delicate skin on your lips, as well as having a small mesh vent that allows limited mouth breathing if necessary. Why you need to shut your mouth! As well as snoring, oral breathing brings other problems that impact upon sleep quality, bad breath, oral health, respiratory health and even face shape . SomniFix shuts your mouth and addresses these problems. Inhaling through the nose is our body’s preferred way to breathe. Keeping your mouth closed with SomniFix not only helps to reduce snoring but also yields other health benefits and tops it all off with a good night’s sleep. 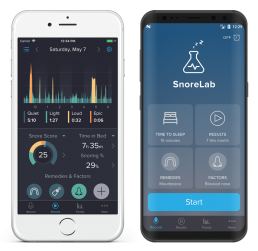 At SnoreLab, reducing your snoring is our primary concern. Open-mouth breathing’s association with snoring is stark; it is one of the main causes of noisy nocturnal breathing. By holding your lips together, SomniFix Mouth Strips keep your airway less obstructed by stopping your jaw dropping that causes parts of your throat to narrow and become blocked. SomniFix Mouth Strips help you to embrace the filtration and humidifying qualities of your nose. Proper breathing can eliminate that uncomfortable dry mouth, bad breath, sore throat, stuffy nose and headache. Having a comfortable night gives you more restful and continuous sleep. Better sleep equals better health. A CPAP mask that fits over your nose ceases to work if your mouth falls open. That air is simply jettisoned out of your mouth instead of holding your airway open as it should. 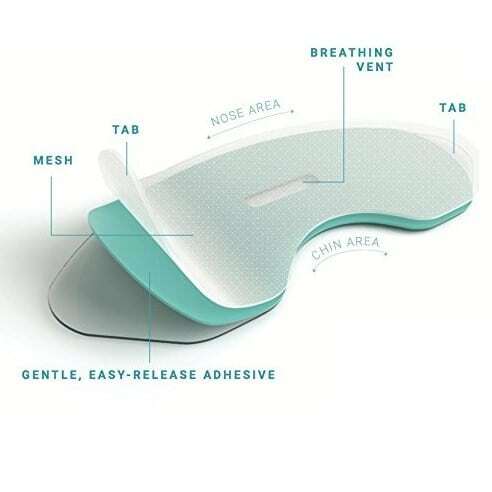 SomniFix mouth strips keep your mouth closed and allow the nasal CPAP devices to work better, making you more likely to stick to your CPAP treatment. They are a great alternative to the cumbersome chin straps that sometimes come with CPAP devices, because with CPAP you already have enough straps to worry about. The mucus and folds in your nose trap harmful invaders. When breathing through your mouth, you increase the chance of inhaling bugs and allergens which can trigger the vicious circle of a blocked nose and oral breathing . Nasal breathing reduces the chance of hyperventilation (over-breathing with frequent, shallow breaths). Proper ventilation leads to optimum oxygen/carbon dioxide balance, allowing for improved blood oxygen saturation . Nitric oxide (NO) has been championed as the “mighty molecule” . The discovery of its benefits in the body even won the Nobel Prize! Produced in the nose and sinuses, it helps to expand the lower airways and blood vessels. Nasal breathing helps push this mighty molecule into the lungs where it can work its magic. By acting to expand your blood vessels, high blood pressure and the associated risks are reduced . Why don’t I just use normal tape? Using standard tape can hold your mouth closed too strongly and cause panic if you awake forgetting that you’ve applied it. Whilst it may serve a purpose overnight, taking it off in the morning can be painful and leave nasty marks. SomniFix’s hypoallergenic material has undergone extensive testing to make sure it doesn’t cause skin irritation, whilst the adhesive is gentle and leaves no residue. SomniFix Mouth Strips also painlessly dislodge through forcibly opening your mouth and have a small breathing vent if you need to revert slightly to mouth breathing. This small hole not only gives you peace of mind, but also mimics the benefits of nasal breathing if you do happen to start breathing through your mouth. Are SomniFix Mouth Strips suitable for everyone? If you find yourself persistently waking with a dry mouth or sore throat, chances are, you’re a mouth breather and snoring as a result. SomniFix Mouth Strips are likely to be beneficial in addressing this bad breathing habit. SomniFix Mouth Strips are a sophisticated and comfortable solution to a common cause of snoring: mouth breathing. We at SnoreLab think these strips have the potential to become one of the first-choice solutions in the anti-snoring market. Transcending the homemade hack solution of mouth taping, SomniFix Mouth Strips are an advanced snoring remedy available at an affordable price. Chang HR. Nitric Oxide, the Mighty Molecule: Its Benefits for Your Health and Well-being. The Mind Society, Jacksonville FL 2011.